What is a concierge? The term seems simple enough, but there are many different types of concierges found in a variety of industries. The term “concierge” is French, meaning “keeper of the keys.” It first appeared in France in the Middle Ages and referred to the person responsible for keeping the keys to royal households and ensuring guests who were visiting had everything they needed. We will do our best to share the most frequent types of today’s concierges that we’ve encountered. Hotel Concierge – A hotel concierge is typically the first image that comes to mind when the word concierge is mentioned. A hotel concierge is available to make a guest’s overnight stay a positive and memorable experience. They often recommend and make reservations to nearby restaurants, arrange transportation and help secure tickets to special events. Residential Concierge – A residential concierge is located within a residential property, such as an apartment or condominium. A unique and appreciated amenity, a residential concierge is often available in luxury properties to attract and retain residents. Personal Concierge – Personal concierges are becoming more common today, especially with high-level executives and working parents who lead busy lives. Their purpose is to simplify the lives of their customers and provide them with more free time. A personal concierge assists individuals with items on their to-do list, such as making travel plans, running errands and planning events. Many times, they are seen as a luxury to a specific lifestyle. A number of personal concierge services are crowd-sourced and app-based, such as TaskRabbit and NeedTo.com. Employee Concierge – Many organizations choose to provide concierge services to their employees as an employee benefit. By reducing the number of items on an employee’s to-do list, employees have fewer distractions, thus increasing their ability to focus and decreasing their stress. Organizations often partner with a concierge vendor that specializes in providing concierge programs. Concierges are stationed within the organization they serve, or have a virtual presence accessed via phone or email. 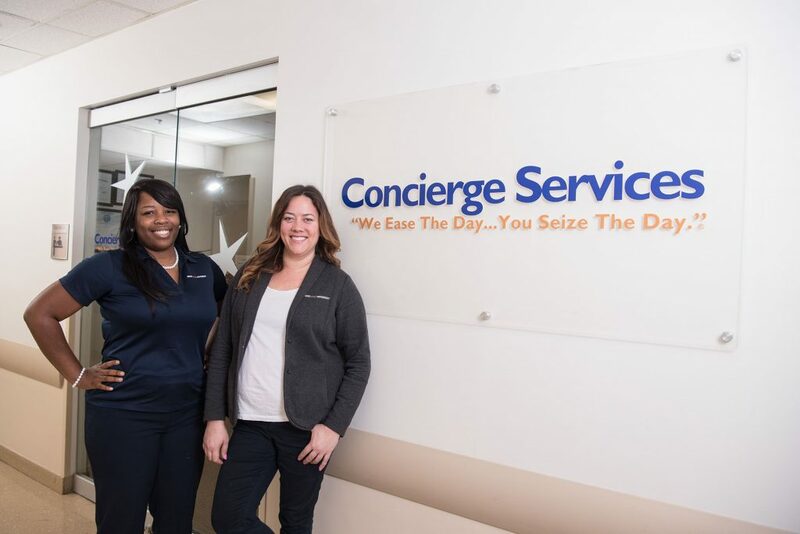 Many organizations offer a concierge benefit as part of their human capital strategies, Great Place to Work initiatives or strategic plans which include taking care of their greatest asset – their workforce. Patient Concierge – A patient concierge is one way for hospitals to meet the unique needs of patients and their family members. Hospitals often partner with a concierge vendor to provide services to all patients, or just for a specific unit. A patient concierge can enhance the patient and family experience during their hospital stay and help improve their satisfaction. Examples of services include rounding to patient rooms, picking up prescriptions and filling up vehicle gas tanks prior to discharge. Patient concierge programs are becoming more popular now that many hospitals see the effect of value-based purchasing and reimbursements based on patient satisfaction scores. Innovative hospitals are realizing the compounding effect of multiple patient experience initiatives, including patient concierge programs. Regardless of what type of concierge a person may be or by whom they’re employed, they ultimately serve the same purpose – to assist in making lives less stressful and give time back into their customer’s day.